Much like The Cat and the Canary, Brewster's Millions (1985) starts out with a message from the grave by Hume Cronyn who plays the deceased great-uncle of Brewster played by Richard Prior. Brewster is presented with an offer he can't refuse. The only shot of the projector is an extreme close-up. This looks more like something you would see in a planetarium. Awakenings (1990) was directed by Penny Marshall. It was nominated for three Oscars including Best Picture and Robert De Niro for Best Actor. Based on true events, De Niro plays Leonard Lowe a victim of an encephalitis epidemic as a child that has left him and a group of others like him in a catatonic state for decades. Robin Williams plays Dr. Malcom Sayer the doctor who administers an experimental drug that for a short time revives Leonard and the others. In a richard marx video "should have known better" his girlfriend is shown dancing in front of the screen when he decides to join in the loving gets out of hand and the screen comes down and the projector crashes to the floor man what a waste. 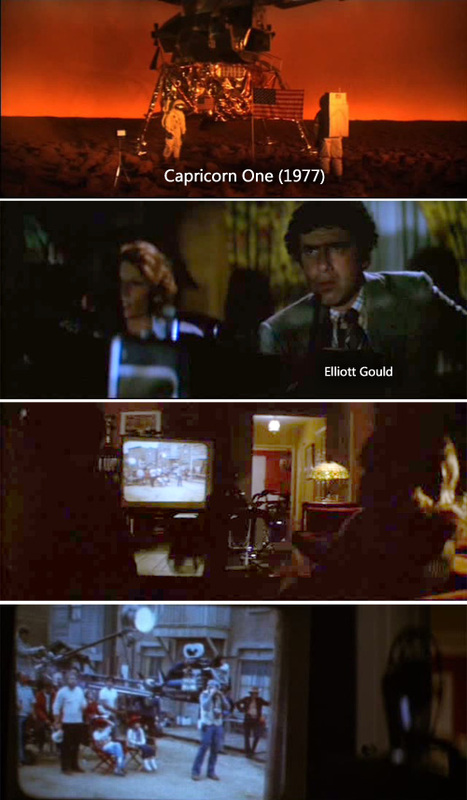 Capricorn One (1977) always seemed like a made-for-TV movie to me with such actors as Elliott Gould, James Brolin and Brenda Vaccaro...and let's not forget O.J. Simpson (way before he became public enemy number one.) This movie is about NASA staging a major hoax and almost getting away with it. The vacation home movies Brenda Vaccaro shows Elliot Gould is a key element in revealing the truth. Hellzapoppin' (1941) was a film adaption of the very successful Broadway show of the same name. Shemp Howard (one of the Three Stooges) begins the movie as the projectionist of a cinema. 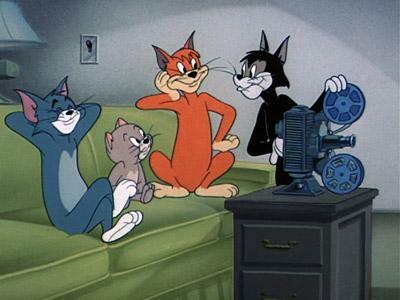 This film has some great visual humor. 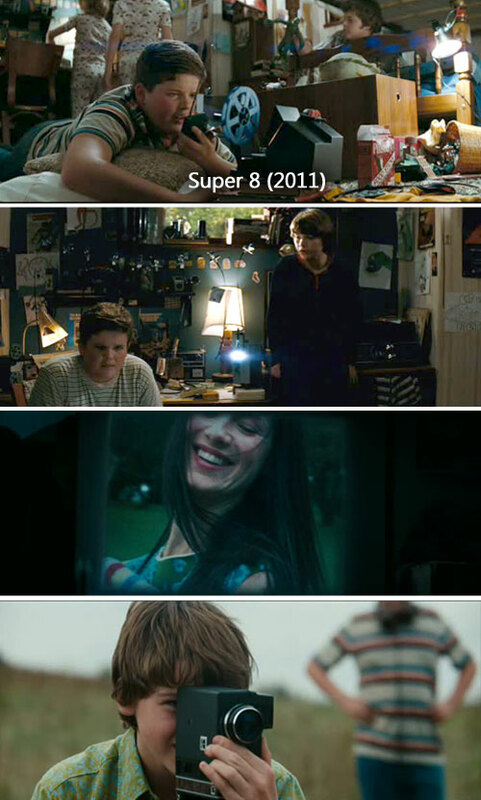 Super 8 (2011) was written and directed by J.J. Abrams and produced by Steven Spielberg. It stars Kyle Chandler (Friday Night Lights TV series). The story takes place in the summer of 1979 when a group of young friends witness a train crash while filming their own movie. Subsequent to the crash they decide to investigate several unexplained events taking place in their town. The storyline for Night of the Comet (1984) has a comet crashing into Earth and pretty much wiping out every living thing...except for two teenage girls...a group of underground dwellers...and a handfull of zombies. The clips are from a scene just before the comet hits...where one of the soon-to-be surviving girls meets up with a guy who works as a projectionist at the movie theater. I've been to the El Rey theater before as seen on "Night of the Comet" to see bands though, no movies were playing but, I did see many movie stars there. Gerald...I'll keep going until I run out of movies. In this classic batman episode frank gorshin plays the riddler is the director and has fun operating the projector as well. This is great Jim...you always find such great TV moments. BTW...I think I'm seeing double...Looks like the Batman pics replaced the pics in your previous Richard Marx post. Hi Janice, the Brewster's Millions pic looks like a 35mm proj. backed by a carbon arc. But the pic looks reversed.Allan. Holy Double Exposure Jim, Janice is right...what happened to Richard Marx? Thanks Janice, when i capture the screen caps I did not change the name of the pictures so they must have over ridden the previous I just happen to dvr that episode saturday night not knowing it was on what luck huh? i have eliminated the pics for now. 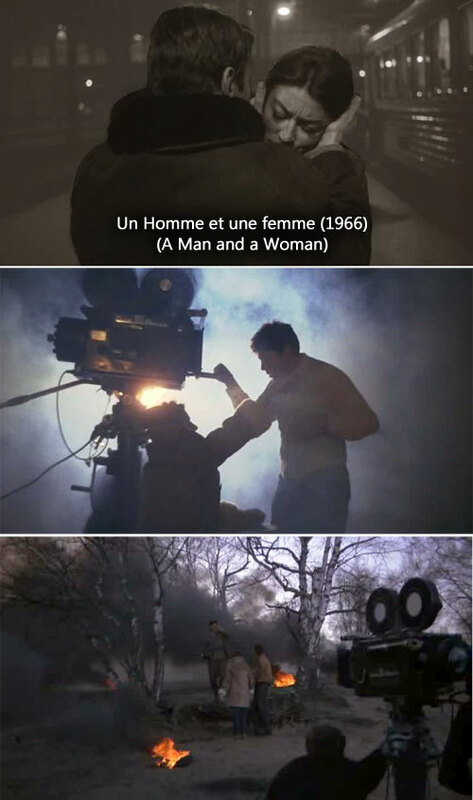 I had to find some way to include one of my all time favorite movies and although there are no visable projectors...there are movie cameras :-) Un Homme et une femme (A Man and a Woman) (1966). I have both the French and the English dubbed version...but I prefer it in French. Claude Lelouch directed this beautiful film that tells more with actions and thoughts then dialogue as scenes switch back a forth from color to black & white. It stars Anouk Aimée, Jean-Louis Trintignant and Pierre Barouh. Ya-ba-da-ba-da! In Targets (1968) Boris Karloff comes to the rescue when a sniper starts shooting people in a drive-in movie. In Death Ship (1980) this humongous projector just happens to be all setup just waiting for someone to wander in to find it... and then know exactly the switch to flip to turn it on I'm impressed...but that's about all that impressed me with this movie. George Kennedy as a Nazi ship captain?....I don't think so. Caine,"FATHOM" with Raquel Welch,"THE WRONG ARM OF THE LAW"with Peter Sellers, Bell & Howells all, plus Billy Cristal using a little 8mm job in "Memories of Me." possess a digital camera,maybe someday. The Stunt Man (1980) has several scenes with a 35mm portable projector being used to screen dailies at the hotel they are filming the movie within the movie. 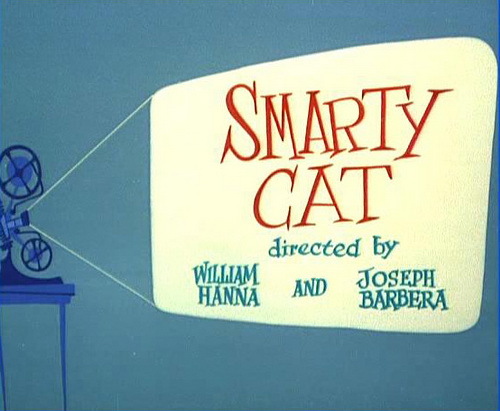 Derann released "Smarty Cat" years ago Its the only Tom and Jerry I can think of that has a projector in it. The Super8 print is excellent "really nice colour" and is well worth looking out for. Now...is that a Keystone or a Dejur?